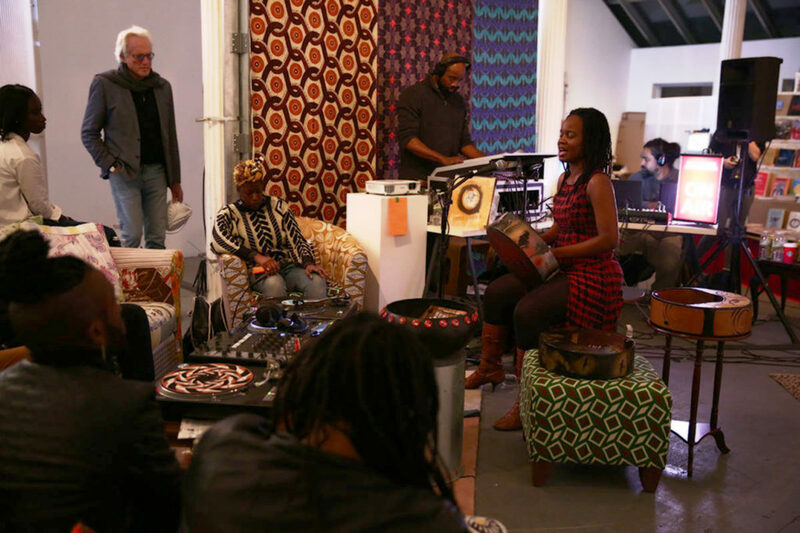 From 11 to 15 November 2015, the Chimurenga Library hosted PASS with a live broadcasting programme of music, interviews, and events with Chimurenga collaborators in New York, including musicians, journalists, writers, curators, and filmmakers. The live broadcast studio functioned amidst an installation that brought together pop-up stores that experiment with trade, informal economies, aesthetics and body language, music and spoken word, mobility and infrastructure. Working with collaborators such as Brooklyn-based African Record Centre and Yoruba Book Center (established 1971); artist and educator Nontsikelelo Mutiti, setup an African hair braiding salon; and poet, choreographer, and Afrosonics archivist Harmony Holiday, ideas, thinking, and debate moved fluidly between events, transactions, broadcasts, conversations, music and records, publications, archive material, services, and objects. Participants in the PASS program included: South African composer Neo Muyanga; Africa is a Country; Hisham Aidi, the author of Rebel Music: Race, Empire and the New Muslim Youth Culture; Moroccan poet Omar Berrada; Cuban-American artist and writer Coco Fusco; curator and choreographer Rashida Bumbray (in conversation with African Arts Festival in Brooklyn); poet, fiction writer, and playwright Rashidah Ismaili AbuBakr; Somali novelist Abdi Latif Ega; journalist and broadcaster Giovanni Russonello; and photographer Marilyn Nance. To listen to recordings from PASS New York, visit our Mixcloud. Category: Articles, Pass Pop-up | Tags: PASS New York, PASS Pop-up | Bookmark: permalink.